A tidal wave has just hit a group of island nations in the southern area of the world, wiping out everything that has lived there. Mau, a young boy of fourteen, was out to sea taking the final leg of his journey to manhood, a custom all boys perform. By a stroke of luck—or curse of the gods—Mau is the sole survivor of the island and is left alone to deal with its many issues. On the other side of the island the Sweet Judy, a ship that crashed ashore during the tidal wave and was pushed through the forest of the island, is all but deserted. The whole crew has been killed during the accident except for a young girl named Daphanie, who was sailing on the ship in hopes of reaching her father. With no way of communicating what has happened to the Sweet Judy, Daphanie must wait for help to arrive. As the only two people on the island, Daphanie and Mau are drawn together to help each other survive. Although there is a huge culture and language barrier between the two of them, Daphanie and Mau form a routine that helps in the building a small nation. During the coming days and weeks, more and more survivors of the other nations are drawn to the island. No matter who is coming to the island—men, women, children or the elderly—they all bring with them unique background experiences and cultural differences. Eventually they all come together and start to build a whole new island that is a mesh of all of their different backgrounds. “Nation”, unlike Terry Pratchett’s Discworld novels, actually has chapters, so it felt a little odd to be reading a Pratchett book that was sectioned off as such. Along with chapters, the major difference in “Nation’s” writing style is that it doesn’t contain the humor element that is usually found in Pratchett's books. While “Nation” does possess the occasional joke or one-liner, the book’s topic is of a more serious nature, so oftentimes the book’s humor felt ill placed or forced. That’s not to say that “Nation” is strictly a downer book because there are many other elements that make up for its lack of humor, such as the adventure and a sense of accomplishment you feel reading about a civilization that is built from scratch. Now the first element that comes across when reading “Nation” is the amount of creativity and imagination required for writing such a book. While it appears that “Nation” takes place on islands in the South Pacific, all of the places are completely fictional as are the customs that the characters observe. So from that point of view, it’s really amazing to think about the amount of thought, planning and depth that went into the book. As far as characters, “Nation” possesses a large cast from Mau and Daphanie to the stranded survivors of the other nations, but it doesn't feel as though the characters were the focal point of the book. Instead, “Nation” focuses more on the rebuilding experience and such questions like why could such a disaster happen, and what do gods really require of people. As a result, character development got pushed to the side and it was hard for me to form any real bonds with any of the characters. One major theme in the book is the belief in gods, like why people have religious customs and the purpose behind such customs. While every reader will react differently to this issue—some might be turned off by the whole questioning of gods, while others may welcome it—I thought the theme almost felt like it was being drilled into the reader, although it’s not really a problem or major ordeal in the book. I did find that the gods talking to Mau in his head was a little confusing though. Besides the issue of the gods, “Nation” also dealt with the theme of death, such as the huge natural disaster that resulted in a tremendous loss of life. Though not as controversial as the subject of gods, death is still a weighty topic and was handled very nicely and thought provokingly throughout the book. On the flipside, a weakness of “Nation” is the whole Young Adult categorization. While the language is that of a Young Adult book, the content, themes and questions the novel asks are perhaps deeper than a teen might understand because they haven’t yet had the life experience. In fact, I think “Nation” is the kind of book that could be dissected more by college students or in book group discussions because it possesses so many aspects worth thinking about. Overall, I was surprised with “Nation”. 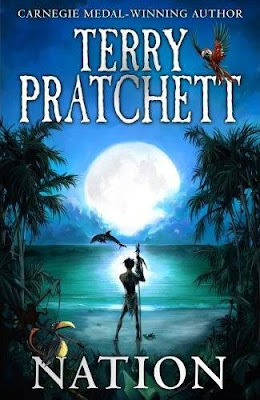 I had read a couple of Pratchett's Discworld novels and was unprepared by how serious in nature the book was. While it wasn't something I would normally pick up, “Nation” turned out to be a unique read that illuminated many things I do and how others may act, in a whole different light. 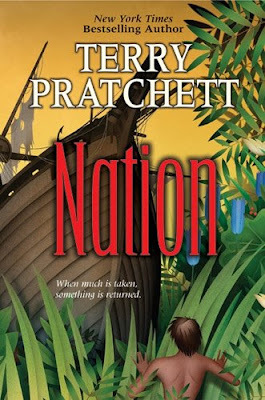 Still, and some will disagree with me, I felt “Nation” was one of Pratchett's weaker books. It might be the lack of humor which is something I've come to associate with the author. Or it could be because I had to work to keep reading the book, and between the lack of adventure and the serious subject matter, “Nation” had a hard time holding my interest. I really did enjoy seeing a whole nation built from scratch and experiencing how each culture had a small part in the building process and the way people had to adapt in order to survive. However, the thrill of reading the book wore off quickly for me and I had to keep trudging to finish “Nation”.